A man in search of his kidnapped sister poses as a member of a cult based on a secluded island. 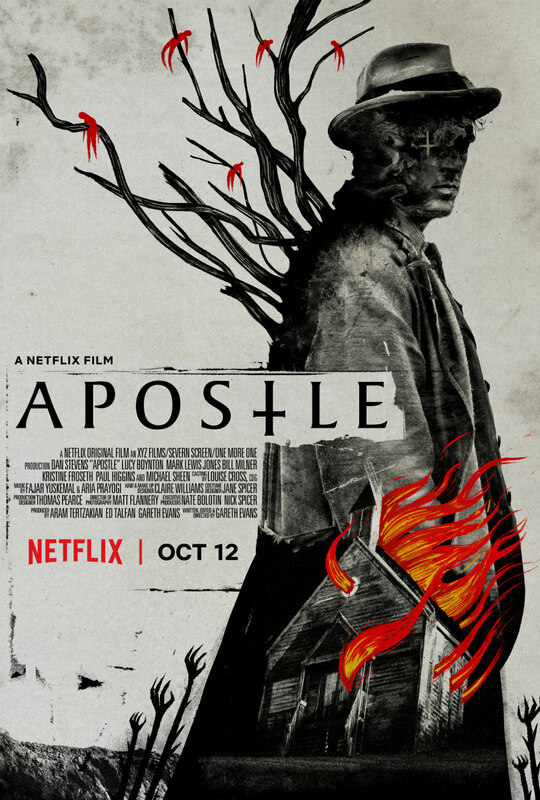 After establishing himself as a director of martial arts action par excellence with a trio of Indonesian lensed movies (Merantau; The Raid; The Raid 2), Welsh filmmaker Gareth Evans is back on his home turf with the Netflix produced Apostle. Evans' latest film sees him leave behind Asia, and with it his comfort zone of bone-crunching, visceral action, for an attempt at brooding and very British period horror. Dan Stevens gives an odd, jittery performance as Thomas Richardson, a former missionary who, like his film's creator, returned to Britain after a spell on Asian soil. Thomas's stay in the East wasn't as fruitful as that of Evans however, with the missionary subjected to violent torture as punishment for his attempts to spread Christianity to the Chinese people. Having abandoned religion as a result, Thomas returns to Britain in 1905 to learn his sister has been kidnapped for ransom by a cult led by self-proclaimed Prophet Malcolm Howe (Michael Sheen). Posing as an inductee into the cult, Thomas heads to the secluded island where Howe and his flock have carved out an existence. There he finds a community ruled with an iron fist by Howe and his troupe of guards, with the inhabitants worshipping a Goddess that may be the island itself, or something more human. Evans is a member of what I like to call 'Generation Moviedrome', that generation of British filmmakers (and indeed critics) reared on the cult movies programmed by Repo Man director Alex Cox and later film scholar Mark Cousins on their Sunday night BBC2 show Moviedrome. You can see the influence of Cox and Cousins' selections in the work of Brits like Edgar Wright, Ben Wheatley and Neil Marshall. One of the key movies featured on Moviedrome was the folk horror classic The Wicker Man, to which Apostle owes no small debt. Both movies feature a male protagonist from a Christian background infiltrating a cult on a remote island in an attempt to locate an abducted young girl, and both cults worship forces that appear to decide whether or not the respective islands will produce a healthy harvest crop. Where Apostle veers away from the 1973 film is in the portrayal of its cult. Led by Christopher Lee's tweed bedecked Lord Summerisle, The Wicker Man's cult seemed harmless at first, an excuse for some very 1970s hippy dippy free love and a return to the land. With thuggish guards dressed in sinister garb that draws on the imagery of the Spanish Inquisition, Apostle's cult is established as menacing off the bat. With the island ruled in such an authoritarian manner, it's difficult then to swallow how easily Thomas is able to evade having his identity revealed for so long. He's breaking curfew at night to wander off snooping, asking probing questions of various islanders including Howe's own daughter (Lucy Boynton), and generally looking as guilty as sin with his constant nervous tics, yet none of the island's leaders seem able to pit two and two together regarding his intentions. This mutes much of the potential for suspenseful, nail-biting set-pieces that might be mined from this scenario, and with Thomas placing others' lives at risk with his poorly conceived undercover investigation, it's difficult to sympathise with his plight. At well over two hours, Apostle is yet another Netflix original that suffers from pacing issues, yet at the same time the narrative feels a little slight. Sheen is wasted as a cult leader whom we never really get to know, and by the end of the film I still wasn't entirely sure what I was supposed to make of him. 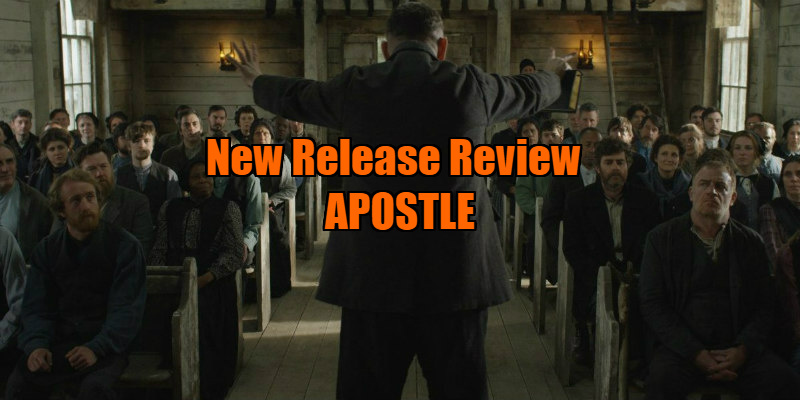 With a rushed final act, Apostle gives the impression of a story that began life as a multi-part mini-series only to end up being cut down to feature film length. Compared to the visual extravagance of the Raid films, Apostle is disappointingly low on memorable images. For the most part it resembles a higher budgeted British TV production, and when in some short bursts, Evans falls back on his raison d'être of elaborate fight choreography, it jars with the movie's slow pace and Gothic aura. With its theme of an undercover protagonist infiltrating a secluded community, Apostle reminded me a lot of last year's Gore Verbinski directed Gothic thriller A Cure for Wellness. Like that movie, it's applaudable in its ambition, boasts a patience testing runtime and sees its creator lay out his genre influences for all to see. Frankly, it's the sort of movie I'm glad to see can still get made in an era when Hollywood is averse to mid-budget productions that can't be easily categorised. I just wish it was more involving. Apostle is on Netflix now.